Just like we said in a recent blog-post, you can’t keep a good one down. 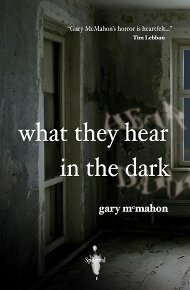 Gary McMahon’s What They Hear in the Dark is certainly one of those, and Ann Giardina Magee of The Horrifically Horrifying Horror Blog seems to agree. Last week she posted a new review of this long sold out classic to HHHB, which you can read here. Alison Littlewood’s chapbook, The Eyes of Water, goes off to be printed today – subscriber copies will start to be sent out next week and promo copies soon after that.